DD Form 2535 or the Request for Military Aerial Support is a document used to request U.S. Air Force participation in public events throughout the United States or worldwide. The form is also used to determine an event's eligibility for receiving aerial involvement or the participation of U.S. Army Golden Knights, U.S. Navy Blue Angels, or U.S. Air Force Thunderbirds demonstration teams. This form is closely related to the DD Form 2536, Request for Armed Forces Participation in Public Events (Non-Aviation), used to request troops, equipment or Army musical units for public event participation. The DD 2535 was last revised on October 2010 - a fillable up-to-date version is available for download below. All previous editions are obsolete and should not be used. 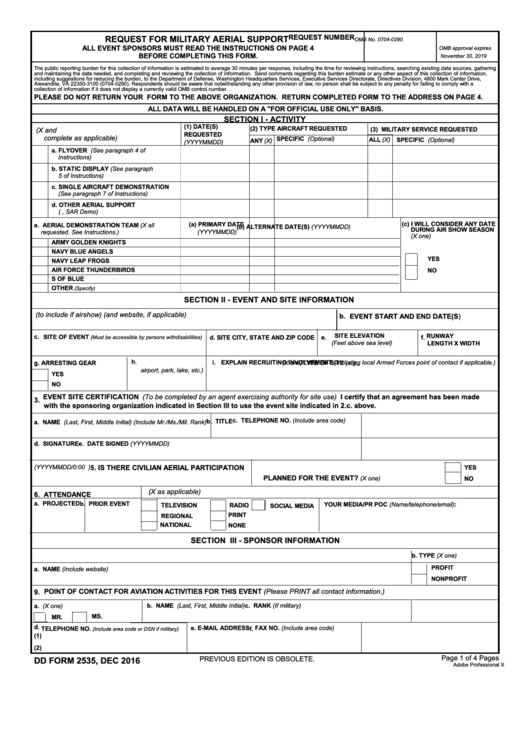 The Department of Defense (DD) Form 2535 is used to evaluate the eligibility of an event for military aerial support. Once an event has been approved as eligible, the sponsor of the event is responsible for contacting the units and coordinating any further military participation. Section I requires information about the requested activity. Fill in the type of activity, type of aircraft and type of military service requested. Specify the dates when your event is scheduled to take place. If you request an aerial demonstration team, complete all of the required options in the corresponding field. Provide as much information about the event as possible in Section II. Fill in the name, and - if it exists - the event's website. Specify the address of the event, describe its site and size. Give information about the event site certification, planned attendance, and possible media coverage. Section III is reserved for sponsorship information. Check all options that apply to your particular event. Section IV is essential for determining eligibility and must be completed in full by the Flight Standards District Office responsible for controlling aerial activities in the area. Describe the program of the event in Section V. Line 22 calls for a thorough overview of funds, parking, seating and attendance fees. For all requests other than Flyovers Section VI must be filled out completely. File Section VII, which requires sponsor certification, date, and signature. The latest edition of the DD 2535 is available for online filing - event sponsors are encouraged to file the form digitally prior to printing it out for eligibility reasons.